Baseball and softball are returning to the Olympics in 2020. Skateboarding, surfing, karate and sport climbing will join the games for the first time. The International Olympic Committee approved the addition of the sports for the Tokyo Games. The IOC called it an "innovative" mix of traditional and youth-oriented events. They are expected to attract Japanese and global fans. The five sports included a combined baseball-softball bid. They were put forward for inclusion last year by Tokyo organizers. Under new IOC rules, host cities can propose additional sports for their own games. Men's baseball and women's softball are popular in Japan. They will return after a 12-year absence from the Olympics. The other sports will be making their Olympic debuts. "Their hearts were broken that they weren't allowed to participate for their country at the Olympics," he said. "Now that's back. In 2020, it's our job as ambassadors of the sport to put on a great show in Tokyo." Before the vote, several IOC members questioned whether baseball would have the world's top players at the games. Pro leagues in Japan and some other countries have agreed to shut down their seasons to send their players to the Olympics. So far, MLB has declined to do so. Franco Carraro chairs the IOC's program commission. He hopes the international federation can still reach an agreement with MLB. 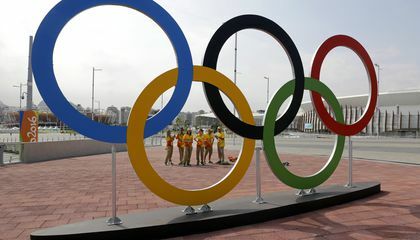 It could be in line with the deals with the NBA and NHL that brought pro basketball and ice hockey players into the Olympics. The surfing competition will be held on natural waves. It will be at a beach location in Chiba prefecture. One of the reasons to add new sports to the Olympics is so other athletes can compete in the games. Another reason the officials consider adding new sports is to attract new viewers globally. With these sports added hopefully more people will watch and attend the games. This will help Tokyo make more money from the Olympics. The Olympic officials consider adding new sports to attract more people and more fans. If there are more people in the Olympics then the Olympics will go on longer and the city will make more money. Adding more sports could possibly get more countries to participate in the games. This would give more countries the chance to win medals. I believe that it was a good idea to bring back softball and baseball, but I'm still wondering about a few of the other sports. What will happen? How will they make time and build so much?! yes! I love softball I'm so happy that it's going to be in the Olympics I'm 2020! because it brings back old times in the Olympics and it is a fun to play new sports. I personally would love to see softball come back to the Olympics. I am a softbal player myself. I was 4 when it stoped so i didn't get it but now i do. Olympic officials consider adding new sports because it will attract more attention and fans to the Olympics.